James Mennie was born in Aberdeen in 1825 to John and Helen Mennie. As a young man he moved to Manchester and in the 1861 census he was living at 11 Drake Street, Chorlton along with his wife, Mary Ann, nee Heywood, and his children. He was described as a “lithographer master”. “Plan of Manchester – We have received through Messrs. Gifford, a very beautifully designed plan of Manchester, with views of all the principal buildings in that city artistically arranged around the margin of the plate. The plan is the work of Mr. James Mennie, a young draughtsman belonging to Aberdeen, now engaged in one of the principal lithographic establishments in Manchester, and, its execution bears out the promise which he early gave of being the possessor of no common ability.” These detailed maps and buildings, designed and drawn by J Mennie, may be seen on The University of Manchester Library website. The 1871 census stated that Mennie was a lithographer employing 14 staff. His address was then 56 Abbey Street, Chorlton. Records show he was a member of the Manchester Literary Club. By this time Mary and daughters had moved to the south of England. Jessie, a music teacher, was to become Principal of Alexandra College in Hastings. 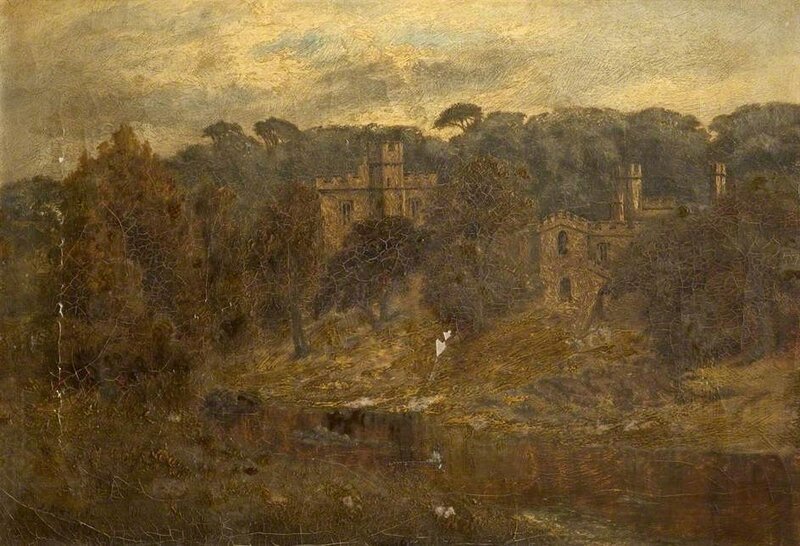 The painting, signed J Mennie, had been 'attributed' to James Mennie as, until early 2019, no other images of paintings by J Mennie or James Mennie had been identified. However, The Friends of the Lytham St Annes Art Collection has been contacted by Mary Dolan, an American, who, on a visit to Scotland bought a painting entitled Loch Awe signed J Mennie, which she had restored and reframed on her return to the USA. Doing her own research she came across the painting of Haddon Hall. The signatures are identical. We are of the opinion that both these paintings are the work of James Mennie. insomuch that its once clear colours have turned brown and muddy green. It is described on its modern website to entice the visiting public as: “The most perfect house to survive from the middle ages”. Set in the heart of the beautiful Peak District National Park and with parts dating from the12th Century it sits “like a jewel in its Elizabethan terraced gardens overlooking the River Wye”. This perfectly describes, and brings to life, the painted image by landscape artist, James Mennie. The view of the house is nestled among the tall, protective trees and seen from the opposite bank of the river. We can only see the upper parts of the buildings and windows. Renovated in the 1920’s, by the 9th Duke and Duchess of Rutland, to make it habitable once again, Haddon is a popular film and television location for romantic dramas such as Jane Eyre, Pride and Prejudice and The Other Boleyn Girl. Nellie Sharples Riley, born 1891, Gladys Mary Eastham Riley, born 1896 and Gwendoline Francis Riley, born 1899, were the daughters of Thomas Sharples Riley and his wife, Margaret Alice, nee Eastham. He was a paper merchant born in Ramsbottom in 1864. The two elder girls were born in Bury but Gwendoline was born on the Fylde. The 1901 census shows the family to be living at 1 St George’s Road, St Annes on Sea and in 1911 at Gloucester House, 7 Orchard Road, St Annes. There, the women were engaged in the confectionery business. In 1922 Gladys married Francis Keen, but her sisters carried on the business, running a shop on the pier as well as the establishment in Orchard Road; 1934 records show the two sisters in business at 5 Garden Street, St Annes. Their mother, Margaret, died in 1939 and their father, Thomas, in 1944 leaving £13,841 6s 8d. Nellie died in 1981 and Gwendoline in 1988. Margaret, Thomas, Nellie and Gwendoline were buried at Lytham Cemetery. Gladys died in London in 1983.